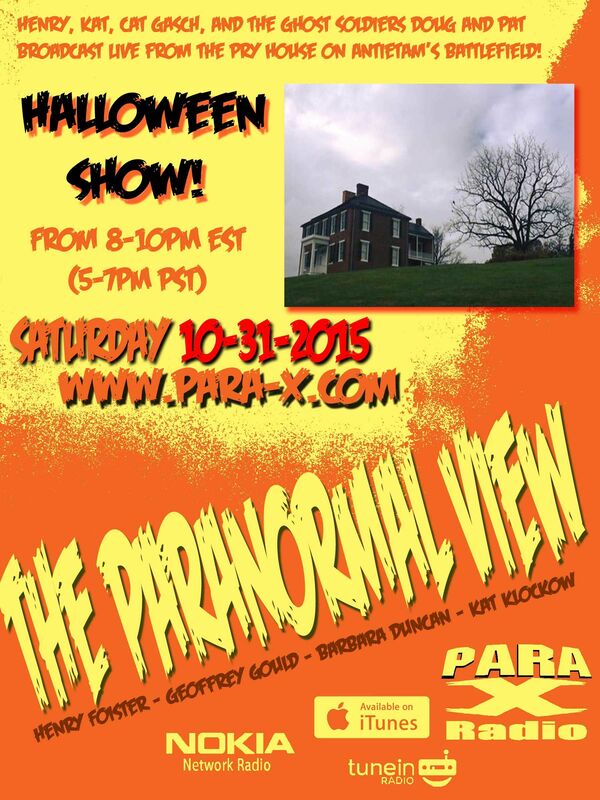 Tonight on the Halloween-on-Halloween show, Henry and katklockow.com broadcast live from Antietam, we welcomed back Patrick McCormack and Doug McReynolds of GhostSoldiers, and author Cat Gasch. Henry introduced Patrick, Douglas. and Cat, and had Kat introduced Jake Wynne of the Pry House Field Hospital Museum, and he provided aspects of the Pry House history. It had a strategic position atop a hill. Jake had an interesting method of relaying history, a combination of present and future tense. He described a few of the reputed ghosts that have been experienced. Kat introduced Katie Reichad of the Pry House, who spoke about a fire at the Pry House in the 1970s. A woman was seen in the second floor, and they wasted time trying to get to her, allowing more of the house to burn, as the area of floor on which she'd have been standing was long since collapsed. About an hour ten minutes into the show, some of the group there heard Whispering by one of the interior doors. Kat set up some equipment in that area. Ceiling Cat Barbara asked about the history after the war between the states, which Katie explained. CC brought us back from the second break, reporting out having listeners tonight from the US, the UK, Australia, Norway, Belgium, Gerany, and Unknown. As Kat and Pat and Doug were talking, suddenly the lights there began going on and off. Suddenly realizing the show had two minutes to spare, Pat barely had time to give out their own show that normally would start right as ours ends, on the Rock with the Shock radio network; he had no time to convey his @patghostsoldiers1 Twitter account, or their Facebook profile, or their theghostsoldiers website. I provided my my Paranormal View hub page on my website, indicating people from there can find the show's respective report pages, and, as I lacked time, implied that on that page was the information that we're very findable on Facebook, the official Paranormal View page page, but did invite everyone to Follow Me on Twitter at @realbadger. Kat had no time to give out the show being on Twitter at @Paraviewradio, her katklockow.com website et al. GhostSoldiers Patrick McCormack and Doug McReynolds.